J.S. Bach’s dad was a musician. J.S.’s uncle was a musician. All four of J.S.’s brothers were musicians and composers. In fact, pretty much everybody in the Bach family were musicians and had been since great-great-great grandpa John Hans Bach, originally a baker, had a mid-life crisis and discovered that he was meant to be a piper instead. By 1685, when Johann Sebastian Bach was born, the Bachs were the German Baroque equivalent of our modern day musical Jackson family. The Bachs were well-known, highly connected, and prosperous. They served as musicians to Dukes, were musical directors at important churches, and were directors of renowned choirs. Even the ladies of the family got in on the act. J.S.’s second wife was a popular singer. J.S. Bach’s father, Johann Ambrosius Bach, had plans for his sons to go far with their musical careers. He made sure that they got top rate educations. Sadly, both J.S.’s mother and his father died when J.S. was only ten years old. J.S.’s older brother Christoph took him in. Christoph had already started a career as organist of St. Michael’s church in Ohrdruf, so he was ideally placed to give his younger brother the finest musical education. Even with all these advantages, J.S.’s career got off to a rocky start after he graduated school. He failed his first professional organ audition at Sanngerhausen and ended up working as a court lackey in a duke’s small chapel. Fortunately, the duke recognized his phenomenal talent. Before much time had passed, J.S. got a good gig playing a brand new organ at Arnstat. The young J.S. was a hot-headed, temperamental sort; a rock star of his time who got into fist fights, refused difficult job assignments and went on an unauthorized, extended leave of absence from Arnstat. The leave of absence got him in more trouble than just needing to explain himself to his employers. He had gone off, originally with permission, to study with Dietrich Buxtehude, a renowned organist from Lubeck. J.S. was very much taken with Buxtehude, so much so that he was resolved to quit his job in Arnstat and stay on as Buxtehude’s assistant and eventual successor. But Buxtehude had a condition J.S. was unwilling to meet. He insisted that J.S. marry his daughter. Marriage to Fraulein Buxtehude was too high a price to pay. J.S. fled back to Arnstat to explain himself and make amends with his disgruntled employers. If J.S. was trying to avoid marriage and not just the unfortunate Fraulein Buxtehude, he didn’t escape for long. Soon after he returned from Lubeck, he got a promotion to a much better post. Then he married his cousin, Maria Barbara Bach, after causing some sort of scandal with her in the choir loft. It seems that the temptations presented by Fraulein Buxtehude and her illustrious father were nothing compared to J.S.’s love for his cousin. J.S. and Maria settled into married life quite happily despite their tempestuous beginnings, and eventually had seven children together, four of whom survived. J.S. got an even better position at the Duke of Weimar’s court despite his flair for drama. His employers at Arnstat didn’t want him to leave, but he argued successfully that since he was now married and needed to support a family, his small post at Arnstat would no longer be sufficient for his needs. Things went well for a while at Weimar. In his time there, J.S. composed a huge body of works for organ, some significant clavier works, a bunch of cantatas and his famous English Suites. But then J.S. managed to displease the Duke by getting involved with the former Duke’s widow. J.S befriended the widow and her two sons as they were all musically inclined, despite the fact that they were out of favor with the Duke. Soon the difficulties between one of the sons, the Duke’s nephew intensified. J.S. found himself in the middle of a ducal family feud and passed over for an important promotion. He decided to seek employment elsewhere, further infuriating the Duke, who wanted to keep J.S. even though he was out of favor. J.S. caused such a scene seeking his dismissal that he ended up being tossed into the equivalent of the county jail for a few months. Fortunately for Maria and the kids, J.S. had another great talent besides being a phenomenally great musician and composer. J.S. was great landing on his feet. Shortly after the hot mess in Weimar, J.S. got a job with Leopold, Prince of Anhalt-Kothen. Leopold was a musician himself and well accustomed to high drama. Prince Leopold wasn’t all that important or well-off as far as princes go, but he did like to live large. When he traveled, which he liked to do often and extensively, he took his private orchestra along with him. While in Prince Leopold’s train, J.S. visited various aristocratic hangouts. He also wrote a great deal of lovely secular music, including his “Well Tempered Clavier” series and many works for duos and threes, chamber music suitable for Leopold’s little orchestra. As a Calvinist, Leopold didn’t believe in showy church music, but very much approved of showy music outside of the church setting. Leopold was an accomplished musician and very much enjoyed playing with his musicians. Leopold and J.S. even had their very own folding harpsichord to take with them on tour. Unfortunately Maria died unexpectedly while J.S. was out on tour with Prince Leopold, leaving a bereaved husband and four motherless young musicians behind. About eighteen months later, J.S. married Anna Magdelena Wilke, a popular singer young enough to be his daughter. Anna turned out to be a kind stepmother and an altogether remarkable musician’s spouse. Using her own musical knowledge and talents, she tutored the extended Bach brood and served as copyist, apprentice and assistant to her husband. Prince Leopold’s budget couldn’t support his little orchestra indefinitely. Eventually he had to disband it, both to save his purse and to please his new wife, who didn’t much like J.S. or the musical road trip lifestyle. Even so, the prince and J.S. remained lifelong friends after J.S. left the prince’s service. Before J.S. left Leopold’s service he had one more triumph; he wrote his now famous Brandenburg concertos for the Margrave of Brandenburg. Anna seems to have invigorated him in more ways than one. Shortly after their marriage, he got the best job of his career, the one that he would keep until his death. As Cantor of Saint Thomas Church School in Leipzig and director of music for all the churches in Saxony, J.S. would go on a huge creative burst, writing huge amounts of new sacred music for the students and churches under his stewardship. In his latter life in Leipzig, he composed scores more music. There were cantatas, oratorios such as Saint John’s Passion and other sacred vocal pieces to write for the excellent church choirs. He composed even more works for the organ and clavier, including many teaching pieces for beginning keyboardists. He and Anna had thirteen more children. The six who survived went on to become successful and important musicians in the Bach family tradition. J.S. was an unusual sort of husband. In a time where most women completely gave up their careers upon marriage, he continued to encourage Anna to keep furthering her musical inclinations, even if she would do so only in the privacy of their home. J.S. wrote special music for her to learn, passed down to us in his two “Notebooks for Anna Magdelena Bach”. Some of the works in the notebooks are in her hand, so she may have had some part in helping compose them. By the 1740’s, J.S. had slowed down a bit with the number of works he was writing, but he wasn’t by any means finished. In 1747, J.S. received a challenge from Frederick the Second of Prussia. The king played a theme for J.S. and requested that he invent improvisations on it. J.S. made a three part fugue on King Frederick’s newfangled pianoforte on the spot. Later, he made Frederick a six part fugue as a work entitled “A Royal Offering”, made from a slight improvement to the king’s original theme. Meanwhile, J.S. was working on his “Art of Fugue”, reckoned my many people to be some of his most beautiful music. He never finished it. His last complete work, “Before Thy Throne I now Appear”, is often used as a codicil piece to finish out performances of the “Art of Fugue”. J.S. Bach died in 1750 at the age of 65, probably from complications from a cataract eye surgery gone awry. He was survived by his second wife, Anna Magdelena, ten of his twenty children, and over a thousand of his musical compositions. His direct line of descendents continues on to this day in Germany. 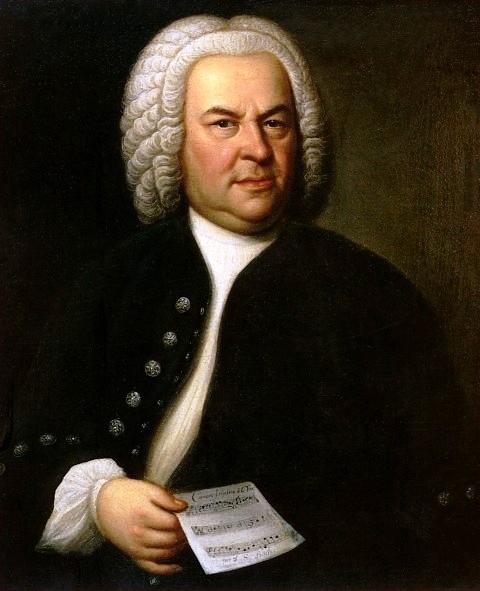 The Bach family name became so synonymous with music in his home neighborhood that musicians were called “Bachs” whether they were related to the Bach family or not.